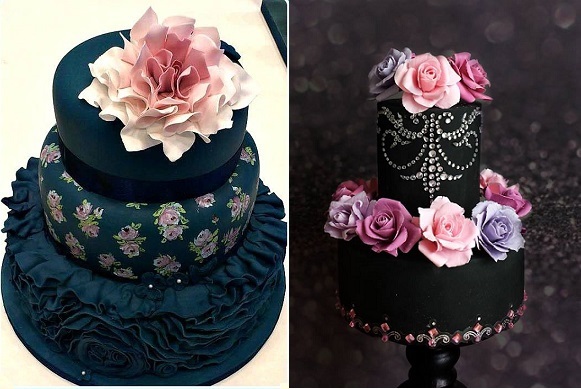 Black-tie has always been synonymous with stylish events, so when it comes to the latest wedding cake colour trends, black icing is sure to wow as the centrepiece of a glamorous wedding reception. 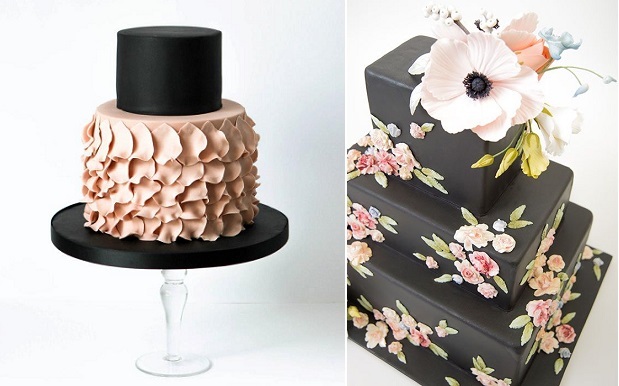 Above we have two chic and elegant examples of black wedding cakes in fabulous, unique designs by Germany’s Pasteles Alma (above left) complemented with dusky pink petal ruffles and by New York’s, Ron Ben Israel dressed with beautiful floral appliques. 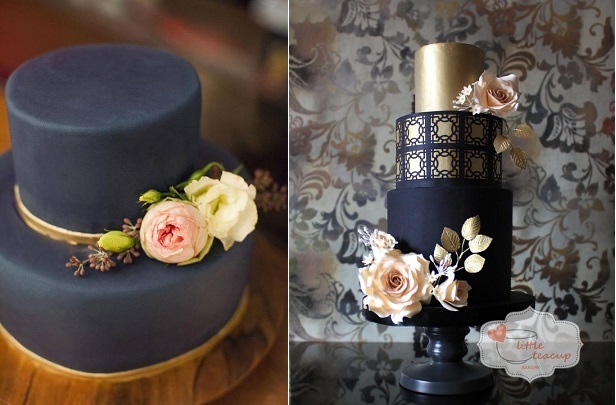 Whether finished with simple floral decor or decorative gold motifs, a black iced wedding cake makes a eye-catching centrepiece, with perfect examples below from Innovative Cake Designs (left) and the Little Teacup Bakery (right). 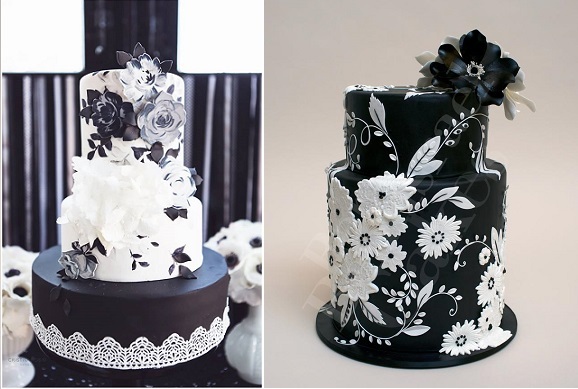 A black iced cake creates a spectacular backdrop against which to set floral motifs, with two superb monochrome designs below from Nevie Pie Cakes (left, image by Cristina Rossi Photography) and Ron Ben Israel (for Martha Stewart Weddings). 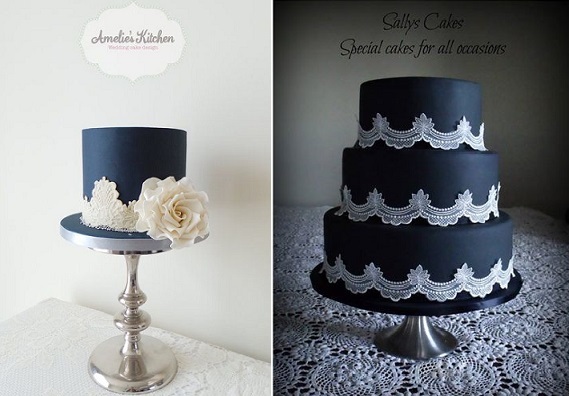 White lace set against black icing simply exudes elegance in the two superb cake designs below from Amelie’s Kitchen (below left) and Sally’s Cakes (below right). 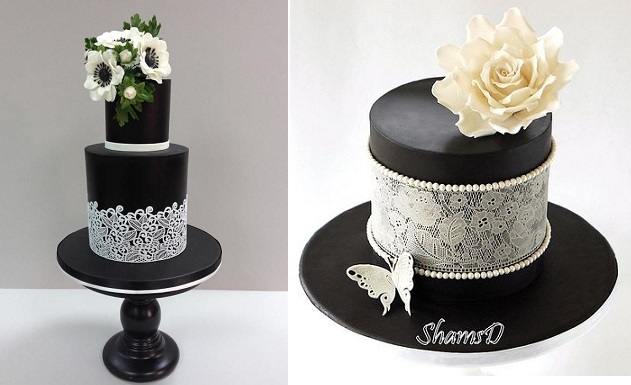 Two more ultra chic cake designs with black icing overlaid with white edible lace by Manal Cakes (left) and Tres Chic Cupcakes by ShamsD, South Africa (right). 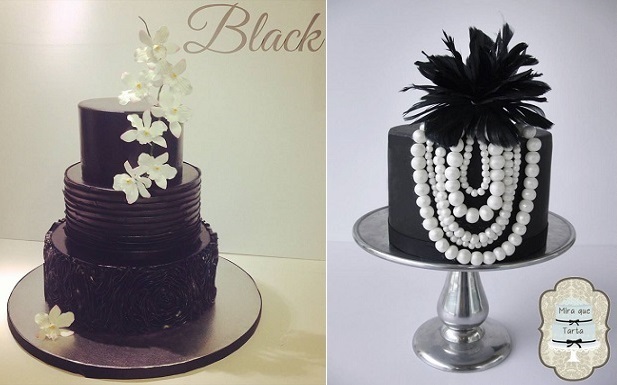 A contemporary styled spray of white orchids adds elegance to the sophisticated cake design below left by The Hobby Caker (left) and on the right, a fashion-inspired cake design with multi-sized pearl beads and showy feathers by Mira Que Tarta. Extended tiers add further drama to the chic and sophisticated black iced wedding cake design below by Elsyia Root Cakes via Style Unveiled. 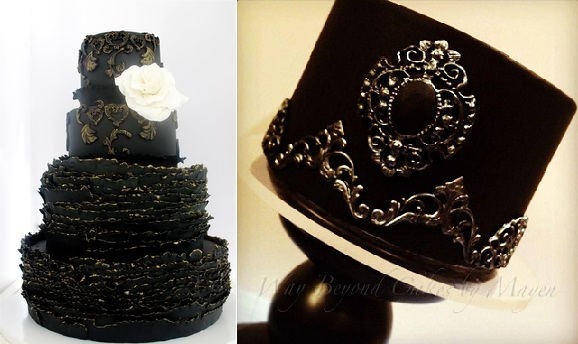 Metallic effect embellishments add opulence to the dramatic black-iced cake designs below by Maggie Austin Cake (left) and Way Beyond Cakes by Mayen (right). 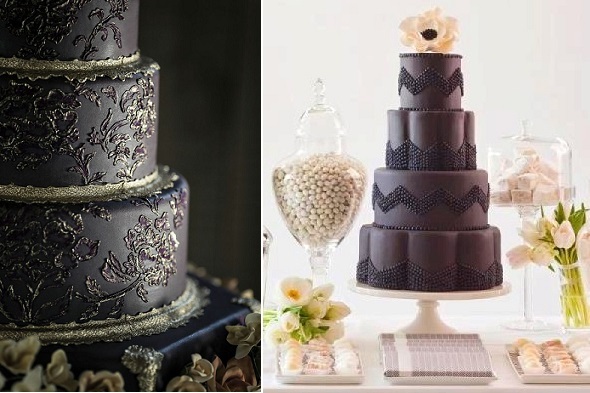 Gold piped embroidery detailing creates a lavish finish on the antique cake design by Ana Parsych (below left), with a unique black beaded chevron design below right (image via Pinterest). 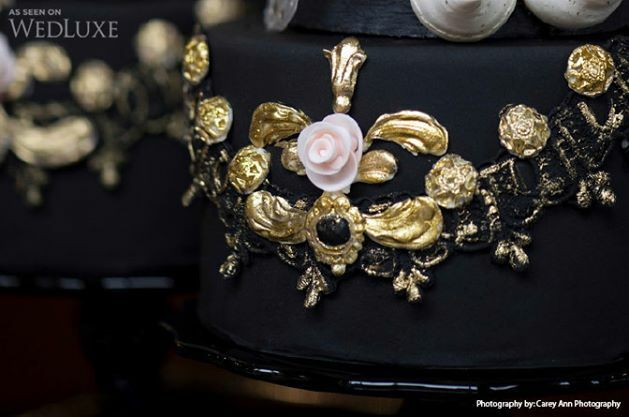 Opulent gold flourishes add wonderful dramatic effect when set against black icing in this stunning period cake design by Nadia & Co. (image by Carey Ann Photography via WedLuxe). 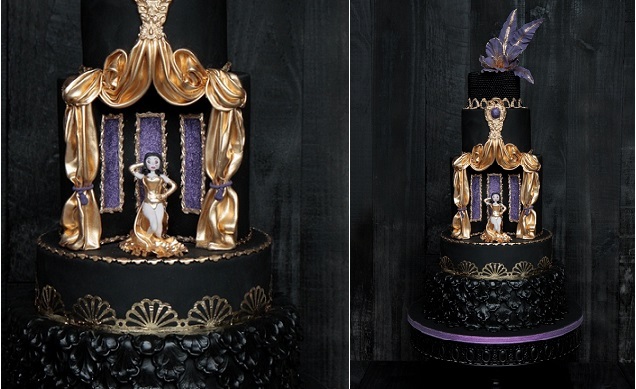 Below, Meel Zuiker of The Netherlands have created a technically amazing theatre-themed cake in a wonderful demonstration of cake artistry. Handpainted rose details add a soft, feminine touch to the vintage style wedding cake by Mon Cottage Cupcakes (below left), with a unique bejewelled design in black icing accented with pinks and lavenders by Unusual Cakes For You (below right). 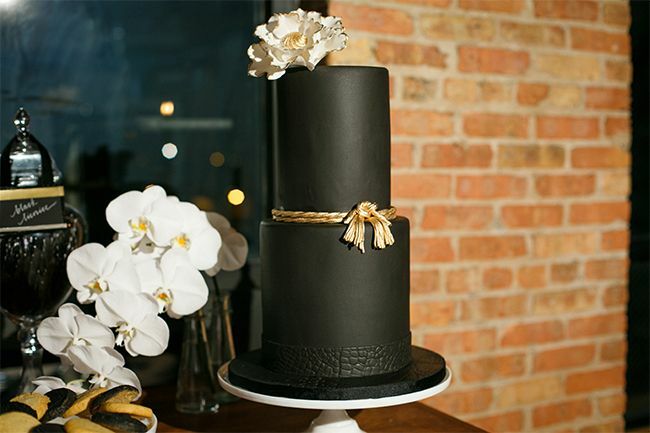 Part 2 of our feature on black wedding cakes is coming up next: Chalkboard Cakes.